The Astronomik ProPlanet IR 807 is ideal for imaging the Moon and planets, with telescopes larger than 250mm when the seeing is poor. The 50,8mm model threads directly to 50,8mm nose that has m48 thread. This filter is an ideal complement to the ProPlanet IR 742 for use with converted DSLR cameras, CCD cameras and Webcams. The effects of seeing are distinctly reduced. It is your entry into previously unknown dimensions of photography of the moon and the planets. 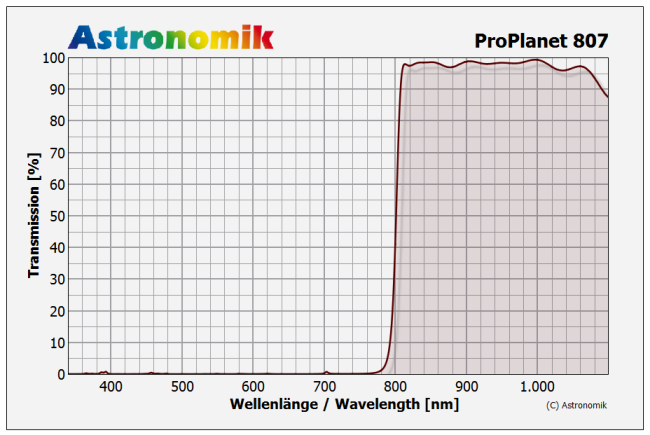 The ProPlanet IR 807 only allows infrared light with wavelengths of more than 807 nm to pass. In this wavelength range the effects of seeing are significantly lower than in the visible spectrum of the human eye. This allows much sharper images than are usually obtained from your device and location. Another advantage is that the sky background of advanced dawn is dark and even allows photography of planets and moon at daylight.